Overlooking the sparkling waters of the stunning Nha Trang Bay, Amiana is a five-star, award-winning resort featuring 153 spacious rooms and villas, each with garden or ocean views and a private balcony. At the heart of our resort is a stunning 2,500 sqm natural seawater pool, a magnificent 700 sqm freshwater infinity pool, and a private, guest-only lagoon beach with soft, white sand leading into crystal clear waters. Luxury is built-in to every aspect of the resort. We offer a truly private and unique atmosphere for individuals, couples or families who seek an escape from everyday life. Ranging from 65 sqm to over 450 sqm, our rooms and villas echo and embrace the local touch, be it a Bat Trang tea set, coffee filter, construction materials made from local coconut products, bamboo or natural stone gathered from nearby. Nestled in a tranquil garden, our 65-sqm Deluxe Rooms are an ideal choice. Choose between a king bed or two twin beds. All ground floor Deluxe Rooms offer a unique indoor/outdoor sheltered bathroom featuring a hand-carved stone bathtub and rain shower. Our Ocean Deluxe Rooms are the latest addition to our resort and have been designed with your comfort and luxury in mind. 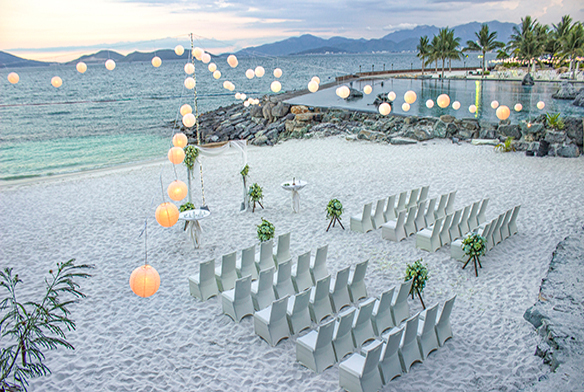 Set to views including the sparkling waters of Nha Trang Bay, the beach and the cityscape, this is a wonderful choice. Our Ocean Villas offer peaceful sea views from a large, beautiful terrace. Each Villa provides a spacious 80 sqm of comfort with a separate living area and features a King size bed. Ideal for those travelling with family or friends, our family villas ensure comfort for everyone, featuring two bedrooms with one King size bed and two Twin beds (maximum 4 persons), 2 bathrooms and a kitchen with full cooking and dining facilities. Inspired by the joy of tranquillity and peace, these Villas are designed with 1 private pool overlooking the ocean with 1 bedroom with King size bed, 1 outdoor bathtub, a living room. The ultimate in luxury, our Ocean Pool Villas are perfectly designed for family holidays or groups of friends. Each Ocean Pool Villa offers plenty of room to relax within 450 sqm, including 2 King size bedrooms & 1 Twin bedroom (maximum 6 adults & 2 children), a spacious living and dining room, and a fully-equipped kitchen. Choose a peaceful, tranquil experience or rev-up your holiday with adventurous excursions. Regardless of what you’re looking for, we’ve got you covered. 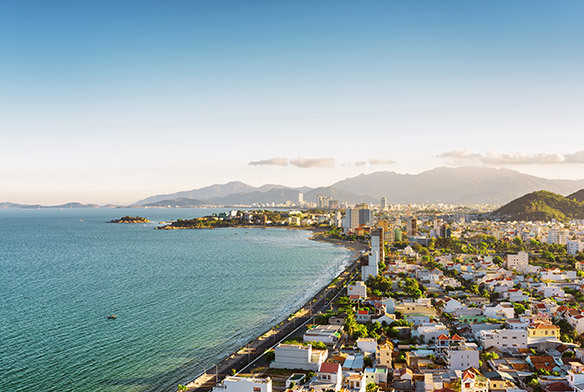 Recognized as one of the 29 most beautiful bays in the world, Nha Trang Bay benefits from such topographical advantages of the sea, islands, mountains and deltas. 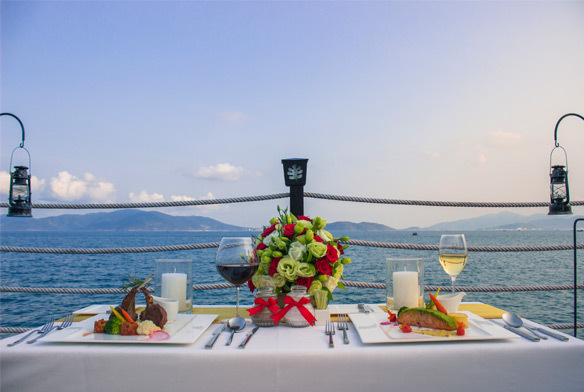 Delicious dishes in a romantic setting make every meal one to remember. Among our specialities, your special occasions, big or small, are as important to us as they are to you. Offering a wide range of sensual, soothing and rejuvenating treatments, a spa visit during your stay is simply a must. Resort is absolutely stunning. Great pool for adults only. Rooms are true to picture images and gorgeous. Have never seen a larger buffet breakfast selection which was yummy with ample choices. Staff are attentive and helpful. Overall a magical holiday ...we will be back. Don't have one bad thing to say about the resort, everything was perfect. Staff go out of their way to help, clean, large rooms, beautiful pools and surrounds, amazing spa treatments. Highly recommend this resort.